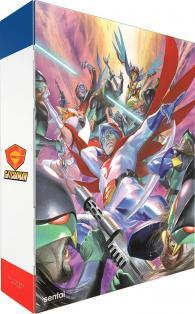 Gatchaman Collector's Edition contains episodes 1-105 of the anime directed by Hisayuki Toriumi plus the OVA's and Movie and comes with a 64-page Alex Ross Artbook. Using amazing weapons powered by super-science, the international terrorist organization known as GALACTOR is out to steal all of Earth's resources for itself and its inhuman masters. Mankind's only hope? The International Science Organization and their elite strike force, the Science Ninja Team! But these five young heroes will have their work cut out for them as they take on the seemingly impossible task of defeating GALACTOR's horrific arsenal of mechanized weapons of mass destruction and endless armies of henchmen. Can costumed commandos Ken the Eagle, Joe the Condor, Jun the Swallow, Jinpei the Sparrow and Ryu the Owl really overcome such overwhelming odds? Utilizing the incredible technology and fighting techniques created by Dr. Nambu, and with the mighty ship the God Phoenix at their command, they just might! Special Features: Interviews, Commentaries, Profiles, Sketches, Audition Footage, Music, and Galleries.